I was on top of it this year (unlike usual) and actually did Christmas cards and got them out a week before Christmas. Then on Christmas eve we checked our mailbox and there they all were. Each and every Christmas card had been returned and on the day before Christmas. Apparently no matter how small the square envelope is a square envelope costs twenty one cents more than a regular envelope. Merry Christmas from the United states postal office. So Im posting my Pictures here. As for what Im going to do with the thirty plus returned Christmas cards that I already paid for... I just don't have the energy to go to the post office and pay a bunch more money to send out two week old Christmas cards. So Im just going to stare at them in my kitchen basket for a while till I eventually use them for fire starters. At least we got super cute pictures. This has to be the first time in a long time where I didn't have to photoshop swap anyones heads. Woot Woot! Gotta take your wins where you can. Lesson Learned: Christmas cards are for suckers. 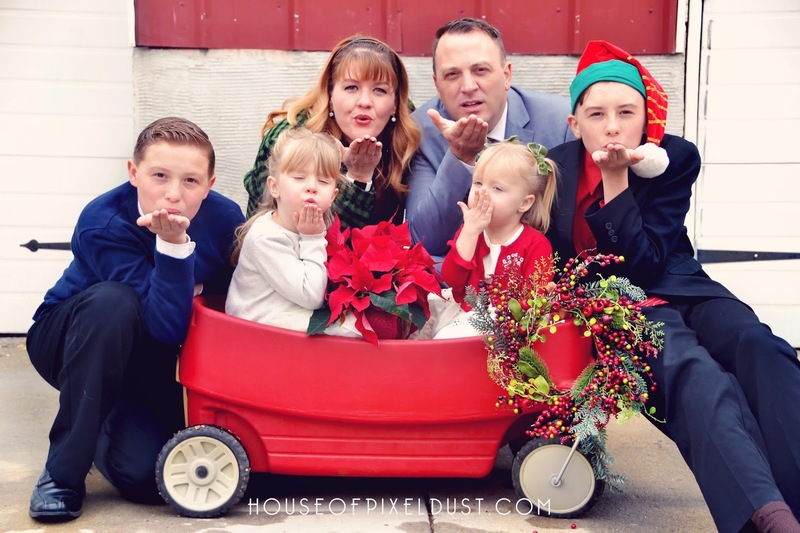 Just skip the Christmas card madness and post your pictures to you social media sites. 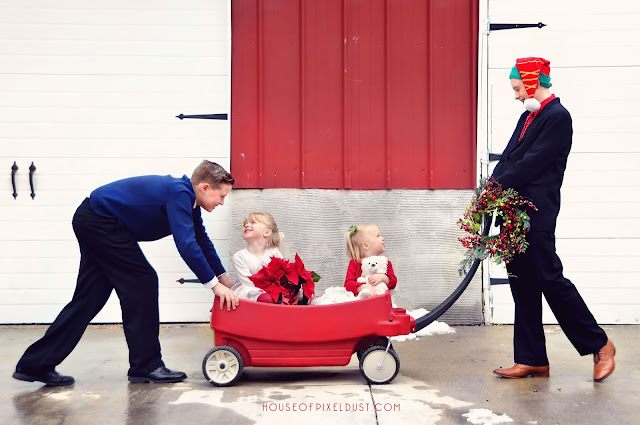 Spend that extra time and energy on other holiday traditions that make you crazy. Or even crazier thought do only Christmas traditions that don't stress you out. Wait... I might have gone to far with that last sentence. 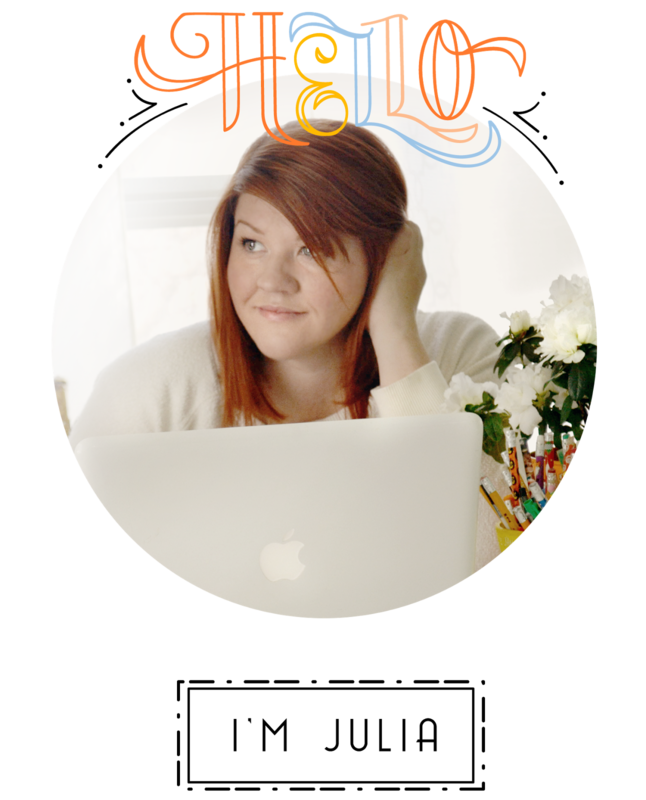 I have clinical anxiety. So there is no such thing. If I spent Christmas doing only the things that didn't stress me out I wouldn't have the Christmases I have always dreamed of having, the kinds of Christmas that are worth stressing for. May 2019 bring your many wonderful opportunities that are worth the work and stress. Winter is something of a strange dichotomy. On the one hand, it’s a long and unforgiving season, while on the other it’s a chance to really appreciate the cozy aesthetics of your home. But make no mistake about it, if your home ends up failing you - or you end up failing your home - then you won’t get to enjoy anything of the latter, and have to take the brute force of the former for three or four long months. The trouble is that conditions are bad for us folks, and they are bad for our homes, too. It can turn problems that seem insignificant in the summer to completely disastrous when it gets cold. And holiday season or not, if you get a huge repair or replacement bill, it’s enough to give anyone the winter blues. Here are some tips to ensure that the cold weather doesn’t affect your at-home coziness while we all wait for the first shoots of spring. Let’s start with something easy. Your gutters will likely be filled with debris from the fall. Unless you clean them out, when rain or snow starts to fall it will collect in your gutter - and once the temperature drops you run the risk of freezing, expanding and leaking everywhere. It might be an unhelpful drip, but it could go unnoticed and end up on the inside of your home, causing damp problems. So, check for blockages and ensure all your drain areas are clear of fallen leaves, moss and other debris. When winter calls, everyone uses their heating. But few make proper use of the ventilation and air conditioning aspects of HVAC systems. 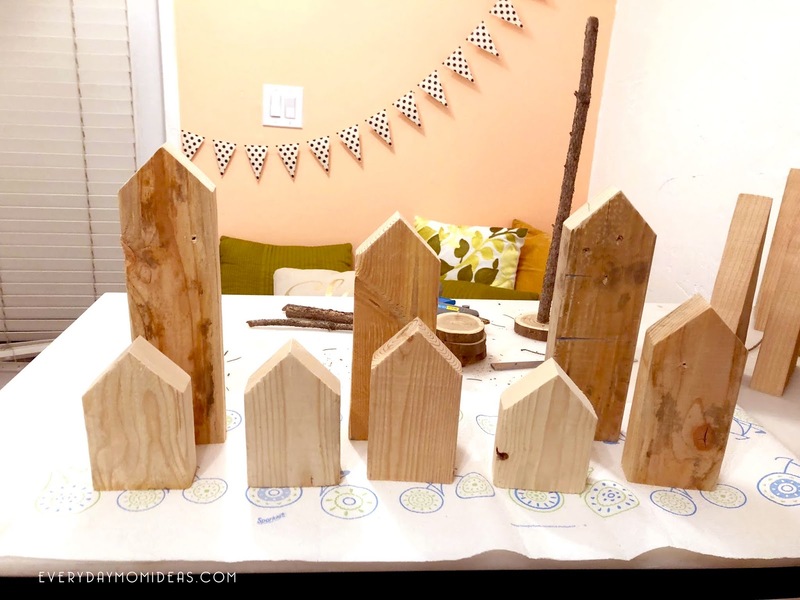 These are incredibly important to ensure you have good quality air to breathe, and also to take humidity out of your home, which could lead to damp. It’s also essential for keeping the temperature in your home at a comfortable level. It’s a good idea to get in touch with an AC company to give your unit a look between now and spring. They can also tell you exactly how you can use it best during the rest of the winter. Your home is designed to allow water to drain away from the actual building. But after the fall, there will be be leaves and all kinds of debris on your pathways, causing blockages and potentially creating pools that eventually run back towards the house. It could end up causing damp, and it’s also a health and safety issue, especially if the temperature is freezing. Don’t expect those leaves to rot away for some time, so clear them up unless you are asking for potential flooding trouble. A final point - according to research reducing your drafts can save up to 30 percent in energy costs per year. That’s an astonishing amount of money that could give you an early start on saving up for next year’s Thanksgiving gifts. Use weather stripping and window film and caulk to ensure heat isn’t being lost in gaps around your doors, windows and floorboards. The quickest way to feel the spirit of Christmas in your heart is to serve others. Serve others as much as you can and as often as you can. If you are ever struggling to find that warm glow you get each Christmas season simply do an act of kindness for someone, and then do it again for someone else. When we serve each other we are giving Christ his birthday present. 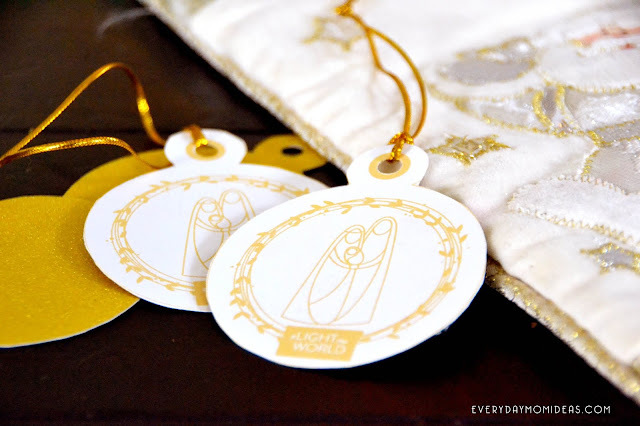 Im so glad you all loved my Light The World Modern Gift Tags I did last year for the #lighttheworld Campaign. Many of you asked If I could do some alternative versions of this gift tag and I didn't have the time last year but I was able to squeeze it in this year. 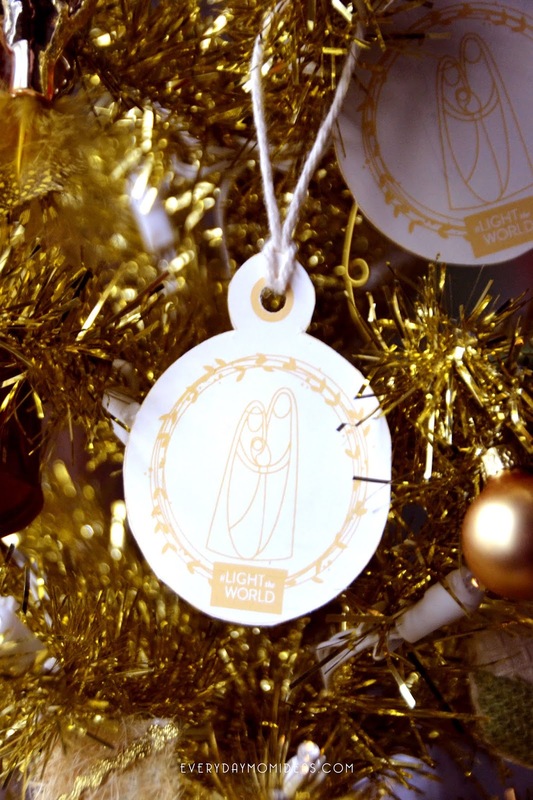 I had someone contact me about making some of these tags for a giving Christmas tree where they could select the name of a child in need and make their Christmas wish come true. 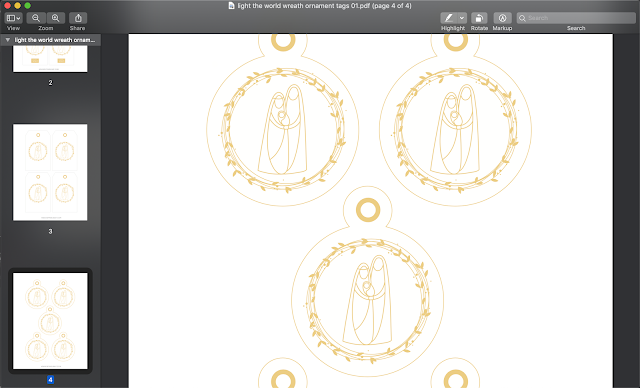 That inspired me to make these paper ornaments out of the nativity design I made last year. 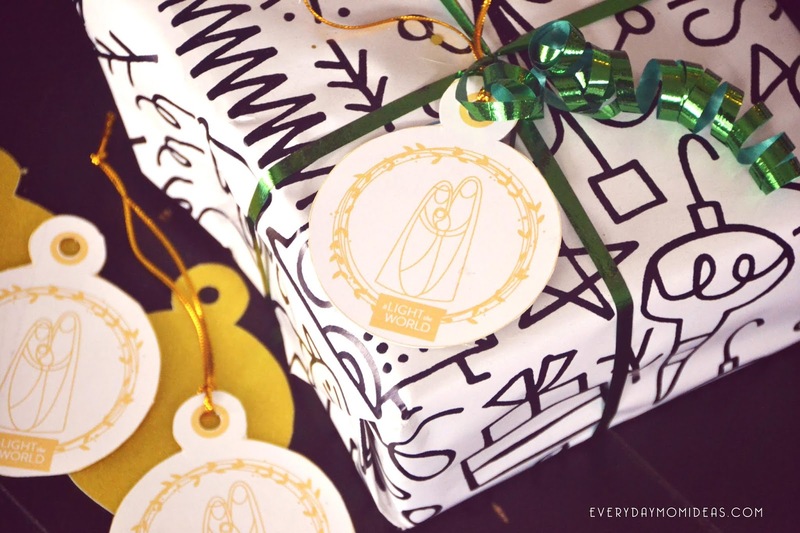 These are perfect for hanging on a tree or putting on a gift. There are even a couple of options available. 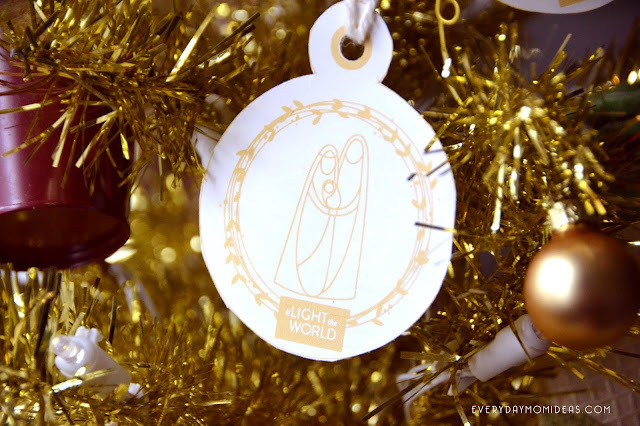 So if you don't want the #lighttheworld on the bottom of the paper ornament you can get some without. There are even square ones available for easy cutting. The year the Light The World initiative has broken the acts of serve down into weekly challenges. You still have plenty of time to join in. This week is Light Your Family. Share your talent and love with your family by writing someone in your family a letter or helping a family member out without being asked to. A simple phone call can go a long way. Get your free paper nativity ornaments here via google drive, its fast, easy and hassle free. 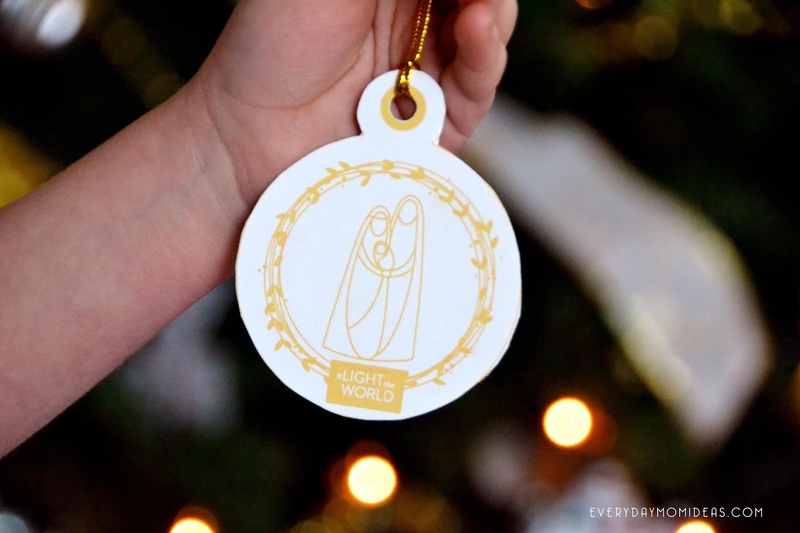 I would love to hear how you are going to be using your Light The World Paper Ornament Tags. Please leave your comments here on the blog or leave me a comment on any of my social media pages. No matter what time of year it is, it feels like you’re always buying new clothes for your children. Back to school? New clothes. Fall and Winter are here? New clothes. The holidays are just around the corner? New clothes. It’s Summer already? New clothes. It seems like a never-ending cycle of shopping for your kids. Plus, all of this shopping really puts a strain on your pocketbook. If it’s not one thing, it’s another, and buying all these clothes really adds up. Especially if you’re buying for more than one child. Thankfully, Gap Australia has you covered. Whether you’re looking for a new sweater as the temperatures turn cool or a new bathing suit for your child to wear to the pool, you can head on over to Gap Australia and find just what you need. The site has plenty of options for you. 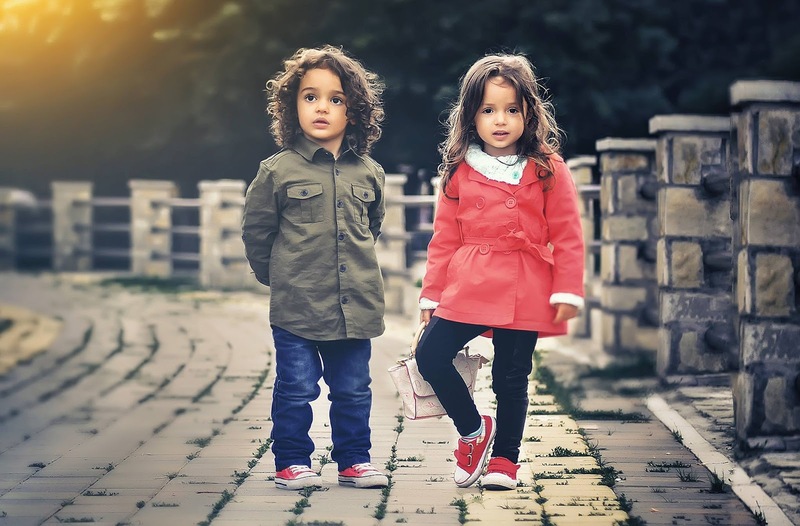 You can choose between clothes for your toddlers, small children, or teenagers all on the same site. No need to browse other stores or navigate to other websites. And of course, The Iconic provides delivery right to your front door. Additionally, there are accessories available for your little ones. The holidays are a great time to stock up on new socks, underwear, and tights for the kids. 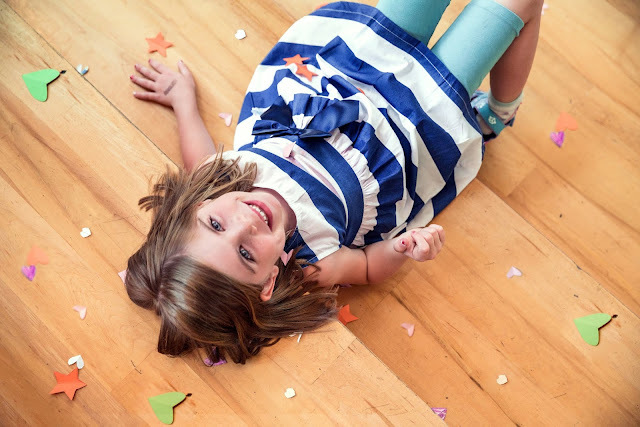 Head on over to the site and you’ll see fun designs and patterns your children are sure to love. But what if they don’t love what you get them? No worries. The Iconic has a no quibble returns policy. So no matter what kind of clothes your kids need, remember that The Iconic is a one-stop shop for it all. Take the hassle out of shopping for kids clothes and head on over to their site. You’ll find everything you’re looking for right at the click of a button. Dreaming of a white Christmas this year? Help yourself to some extra good slumber vibes with a stunning Christmas dreamcatcher that you can make all by yourself. Dreamcatchers are said to be able to watch over you at night and catch the bad dreams trying to disturb your sleep. Dreamcatchers will only let the lovely dreams past through its nets and into your head while the bad dreams get caught in its webs of yarn and string. Im completely in love with the BOHO movement that is bringing back all these natural earthy moods mixed with a soft touch of feminine glamour. And I am especially excited about seeing it pop into a lot of Christmas decor this holiday season. 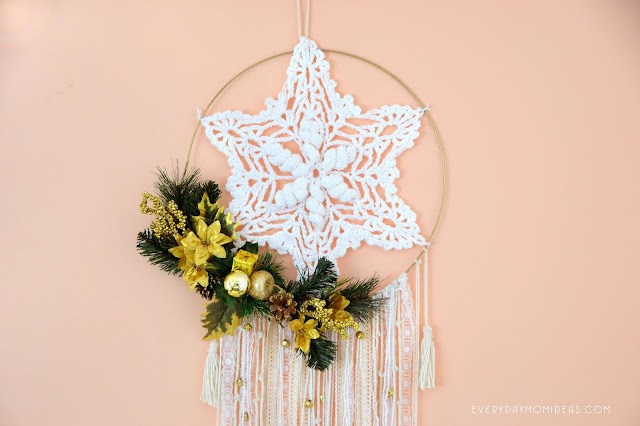 I have been so inspired with the new/old trend that I decided to make a dreamcatcher wreath decoration this Christmas season and put a holiday spin on it. And Its everything and more I could have wanted. The jingle bells are the best part and it makes this a fun decoration to put on a front door because the door will chime when people are coming in and out, and maybe a bunch of angles are simultaneously getting wings as well. 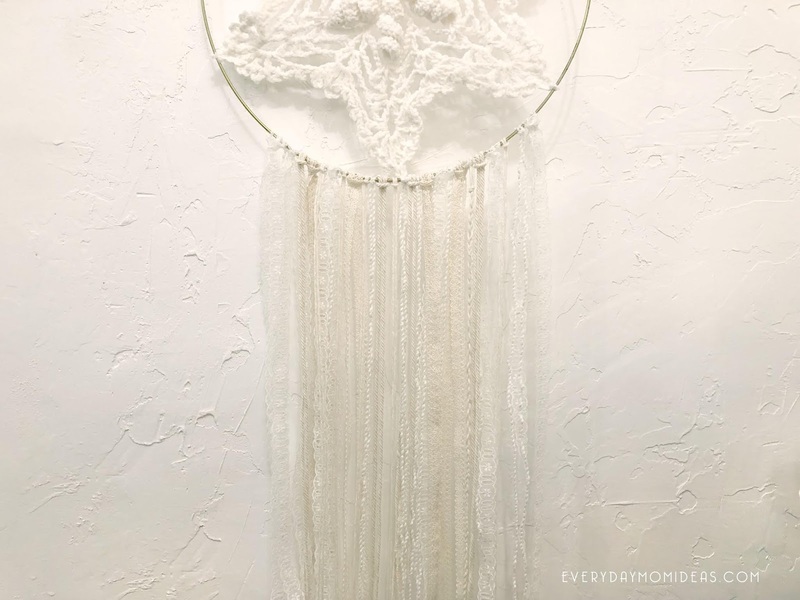 I love how dreamcatchers just show of thread textiles like lace, ribbon and yarn. 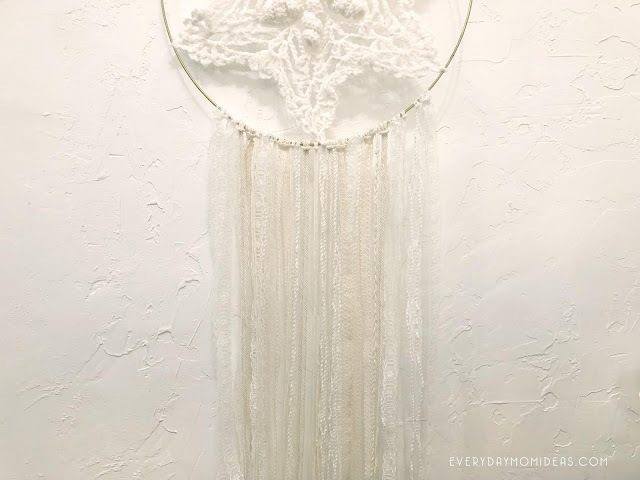 In this Dream catcher you are just hanging strings of lace, ribbon and yarn over and over again. Not doing any fancy ties or weaves, just letting it be with a few knots and jingle bells and then putting in on display as itself. 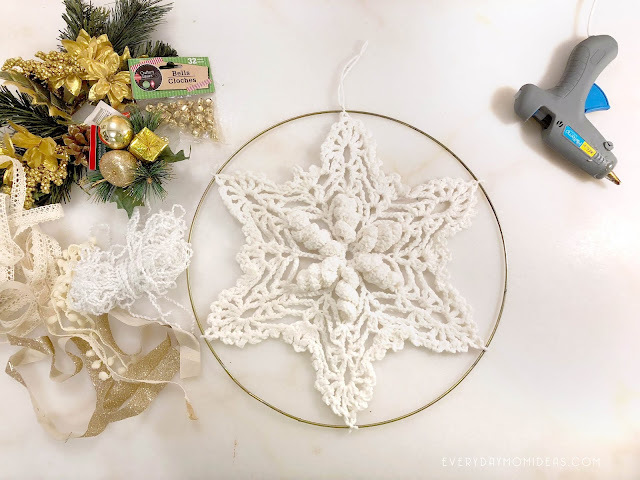 The Main part of the dreamcatcher is made up of a Christmas star doily that my sister crocheted from this free crochet pattern here. I love this design because this star can be a snowflake, star or even be interpreted as a poinsettia flower. Anyway you interpret this pretty crochet star it looks christmasy so you win any way to see it. If you are not a crocheter you can just go ahead a use any doily to get the effect. You can find doilies already made at your local craft store or thrift store and they are pretty inexpensive. 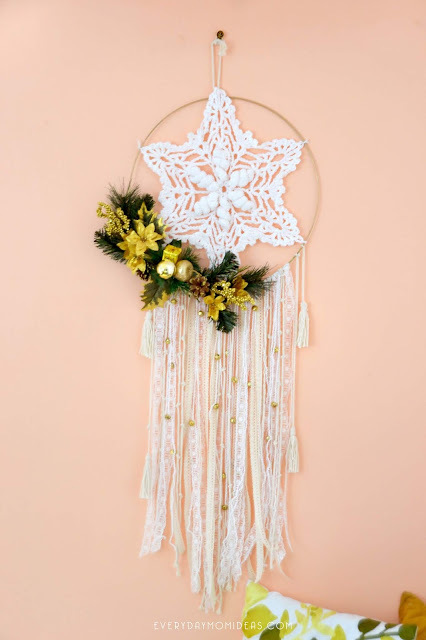 These Christmas dreamcatchers make fantastic replacements for the traditional Christmas wreaths. Every dreamcatcher should be different and I encourage you to get creative with your own without a lot of technical skills. They are so easy to make and don't have to cost a lot of money. I made mine with a lot of things I found at the dollar store. 1. First thing you need to do is to secure your Christmas doily. You can just tie it on with extra yarn and just the little pieces off. I would recommend adding a tiny bit of discrete hot glue where the yarn is secured onto the craft ring so the doily doesn't slide around to much. 2. Once the doily is secured you can move on to the real fun part. Adding the lace to the bottom. I love having a wide array of ribbons and yarns to mix in with my lace. 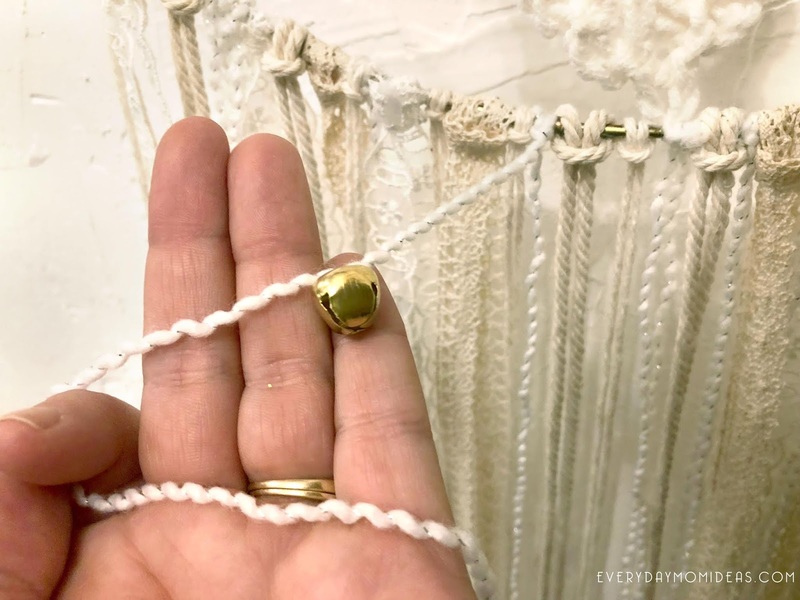 Get all of your lace and ribbon on with a standard larks head knot, that utilizes doubling over the string and securing it to the ring. Do not trim your lace at the bottom until your entire dreamcatcher is done. 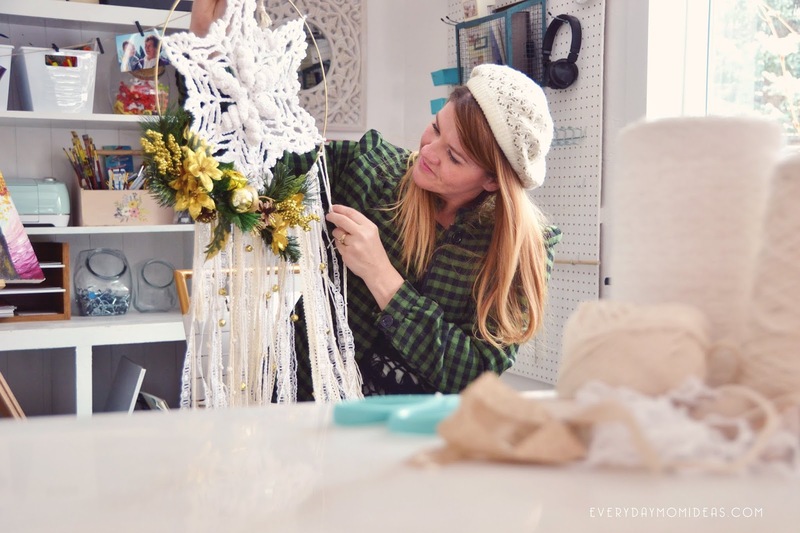 Adding knots, bells and floral arrangement can change the lengths of you lace and string and mess with your lace line at the bottom. 3. Once all of your ribbons are on you can play around with different knots and tying your bells on. When you tie your bells on you will want to start with tying the upper bells on first and working your way down the sting. Only tie one to three bells on a sting. I liked tying my bells onto the yarn not the ribbons because the yarn was thinner and lighter. The bells help weigh the thin yarn down so the yarn doesn't wisp all over the place. 4. 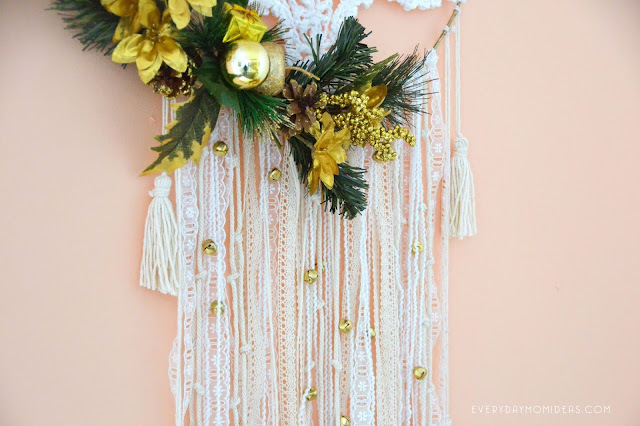 Adding Tassles: I feel like the tassels on the sides of the dreamcatcher really bring the whole design together and weights the lace down nicely. 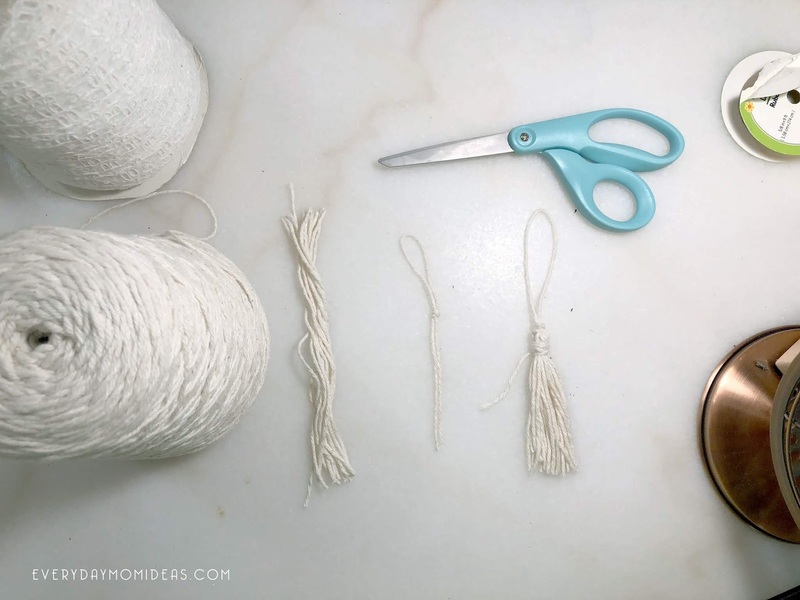 Tassels are really easy to make. Just roll a bunch of your macrame yarn around your hand about eight to ten times. Then cut the bottom of the loops of sting so all of your stings are the same leant. Then tie the loop tie around the middle of your bunch of sting. Fold the string down in half. To keep the stings all pointing down nicely take a piece of yarn and wrap it around the top of your tassel. I made this quick one minute tassel video that might help you make it faster. 5. And the very last thing you add on is the floral accents. I bought three Christmas floral bouquets at my local dollar store. They were completely perfect for what I was wanting. I also found some beautiful lace ribbon and the jingle bells there as well. Lots of crafting goodies at the dollar store. 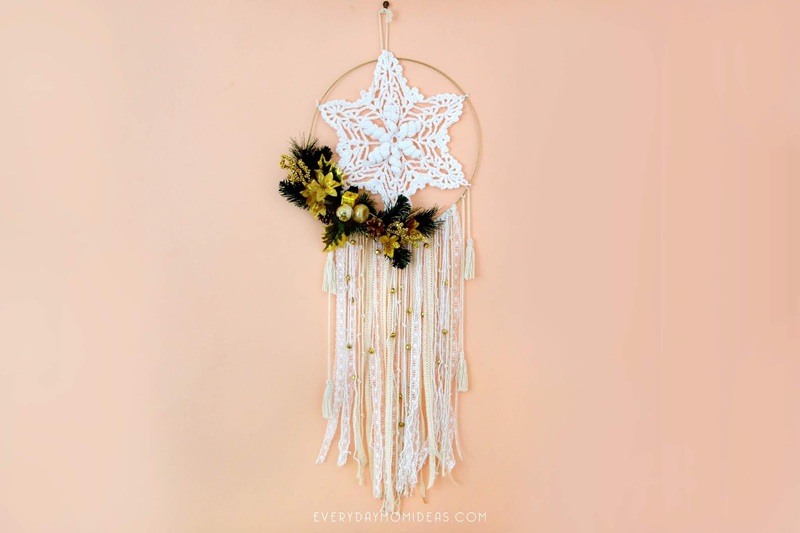 Just hot glue your flowers where you want them and in seconds your dream catcher is ready to hang and bring your some much needed boho Christmas cheer. 6. Trim: Don't forget to trim your lace at the bottom. I cut mine into a tip at the bottom but you can cut your strait or keep your ribbons uneven. Just do what looks good to you. 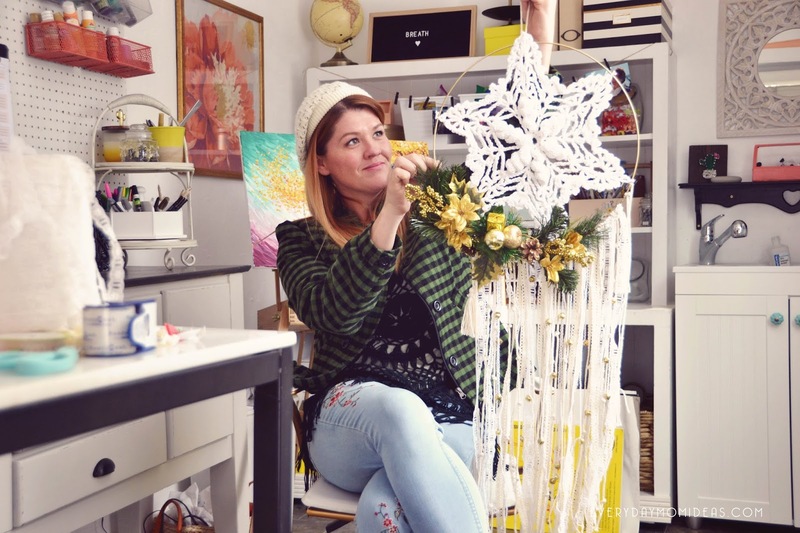 TIP: If you take extra care to store your Christmas dream catcher away after the holiday you will be able to enjoy this dreamcatcher for years to come. These Christmas dream catchers also make wonderful gifts and look beautiful over the heads of little ones with sugar plums dancing in their heads. 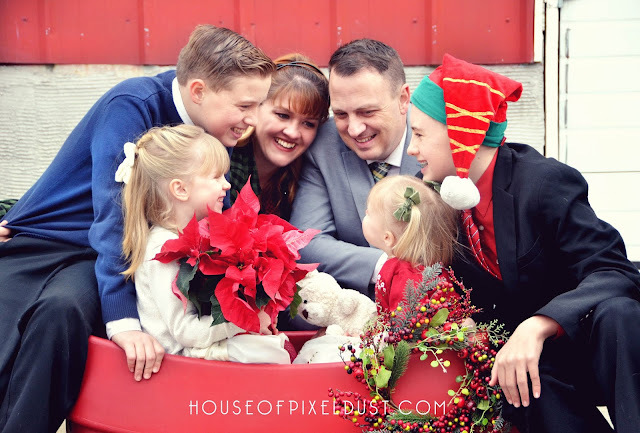 Please share this Pinterest friendly image below with your fiends and family or save it to inspire you next year. I have a bunch of random 2x4 scraps left over from all of our Home Remodeling this summer and Im always looking for creative ways to use them. 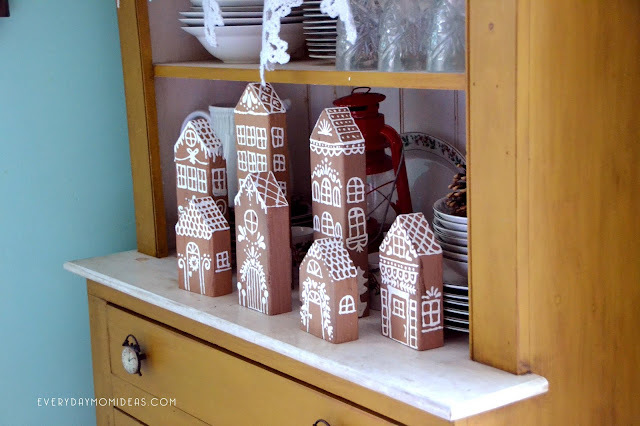 This Christmas I decided to try my hand and some 2x4 scraps into ginger bread houses!!! And Im so glad I did. 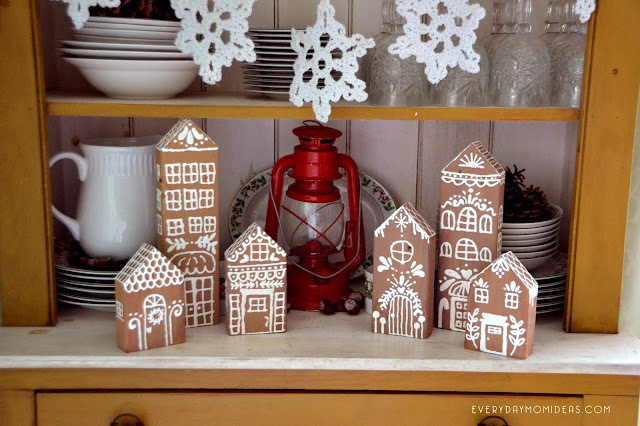 It was cheap and so much easier to make than real ginger bread houses. And the best part is that I can use them again next year. I wanted to make a ginger bread village and made eight different size gingerbread buildings. You can also just make them into sets of three and give them away as adorable Christmas decorations for your loved ones. This can also make a great kids craft for the grandparents. The secret to awesome 2x4 gingerbread houses is to use puffy paint/ fabric paint. When the puffy paint dries it stays a little bubbled up instead of drying flat like white acrylic paint. So the white puffy paint looks more like real frosting when its dried. I think the fabric paint makes all the difference. 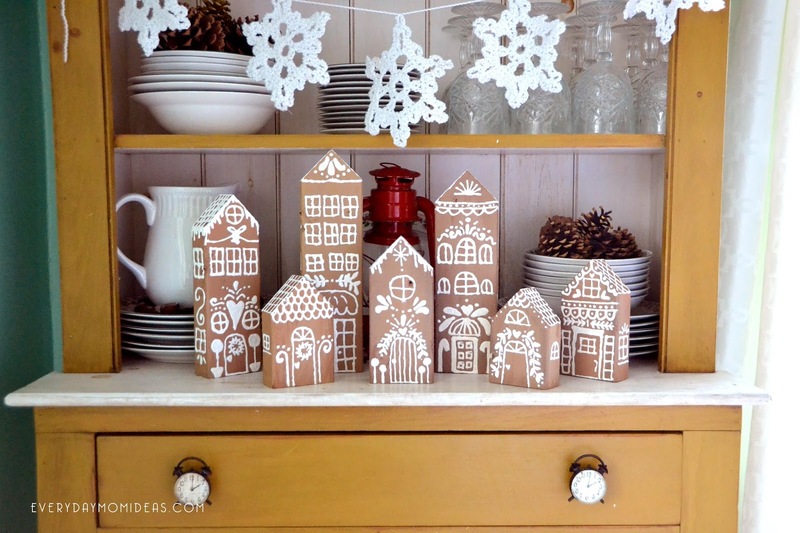 There are so many ways to decorate a 2x4 gingerbread house. 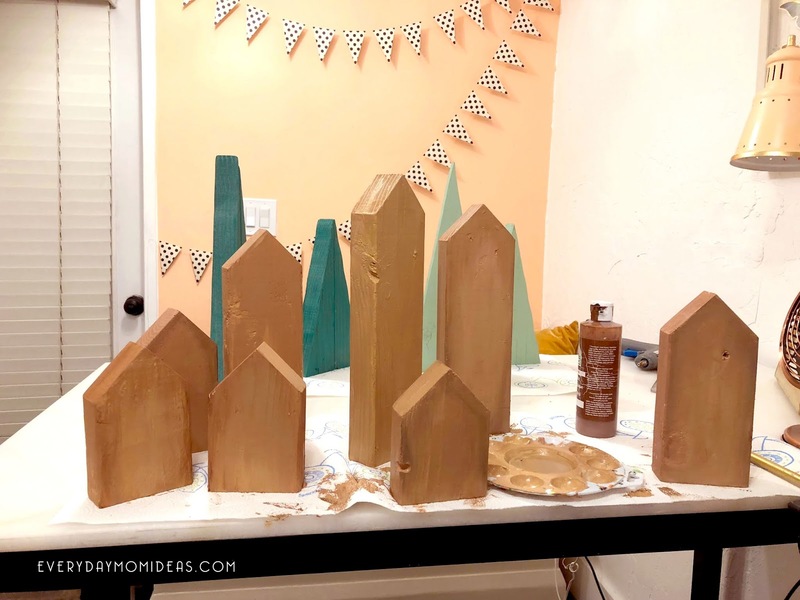 I really liked the idea of just using white fabric paint instead of adding a bunch of colors, that way I can add the gingerbread village to any of my decor and no matter what color scheme I go with the ginger bread houses will continue to fit in. But if you want to add a little red and green go for it. I bet it will look awesome that way to. 1. 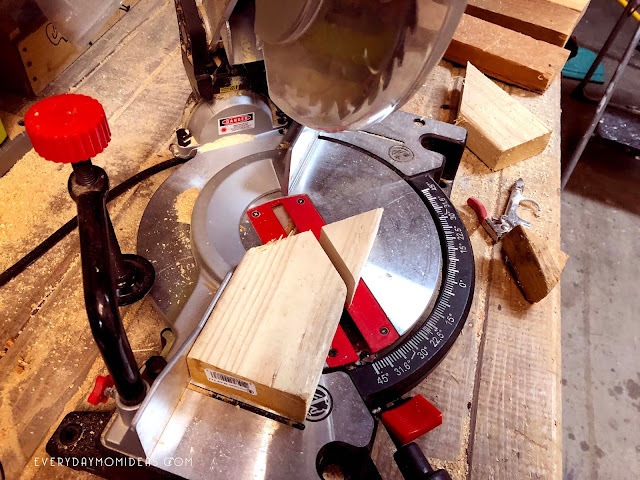 Set Miter saw to a 45 degree angle and cut one corner off. Then flip the house to the back and cut the other corner off from the middle to create the triangle of the roof. Don't worry if the tirando is not quite even it will give your houses a fun quirky look. 2. 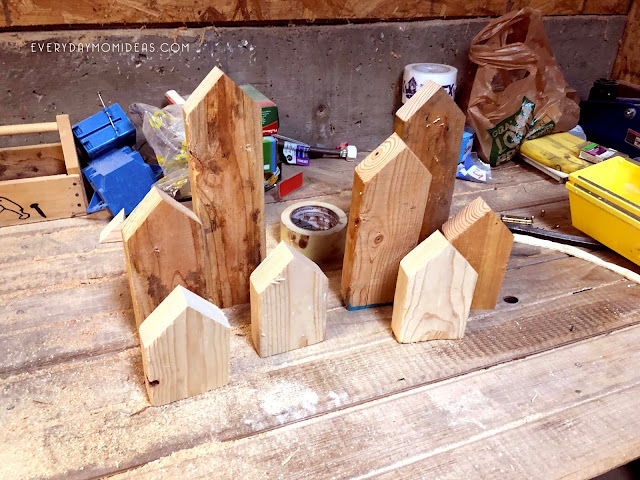 Once all of the houses are cut don't forget to sand all the edges and tips so they are smooth. This will also help reduce the risk of slivers. I learned that the hard way of course. 3. Now you can paint the wood houses and nice summer gingerbread brown. I suggest you mix your brown with a little white to get the right shade of cookie brown. The standard strait brown you find at most craft stores are a little too dark and needs to be lightened up. 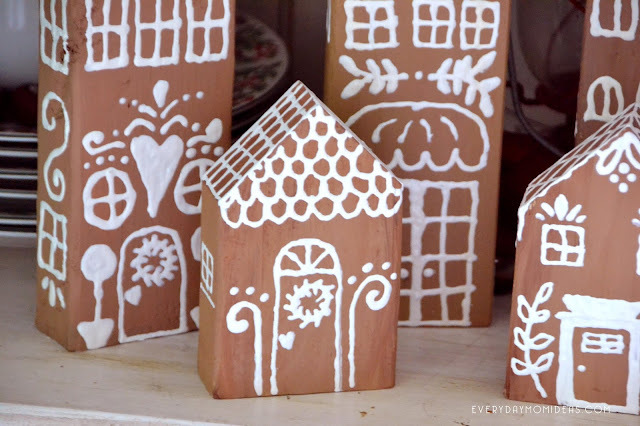 Paint Tip: If you want to add a little extra pizzas to your gingerbread houses you can paint the edges a darker brown to give it that just-toasted touch. 4. 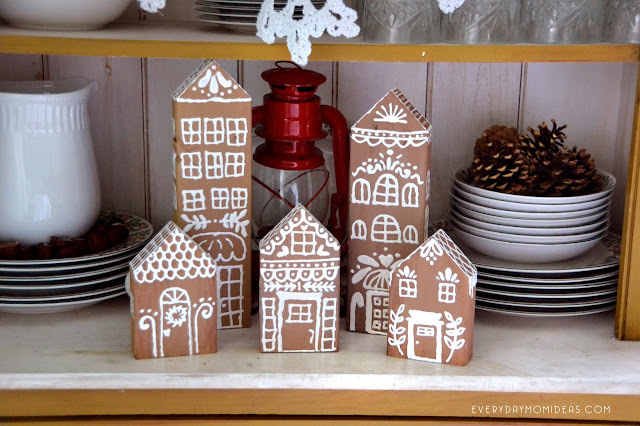 Let dry over night: These gingerbread houses are easy to make but you must leave room for drying time overnight. The craft paint only takes about an hour or two to dry. But I let mine dry overnight for extra measure. 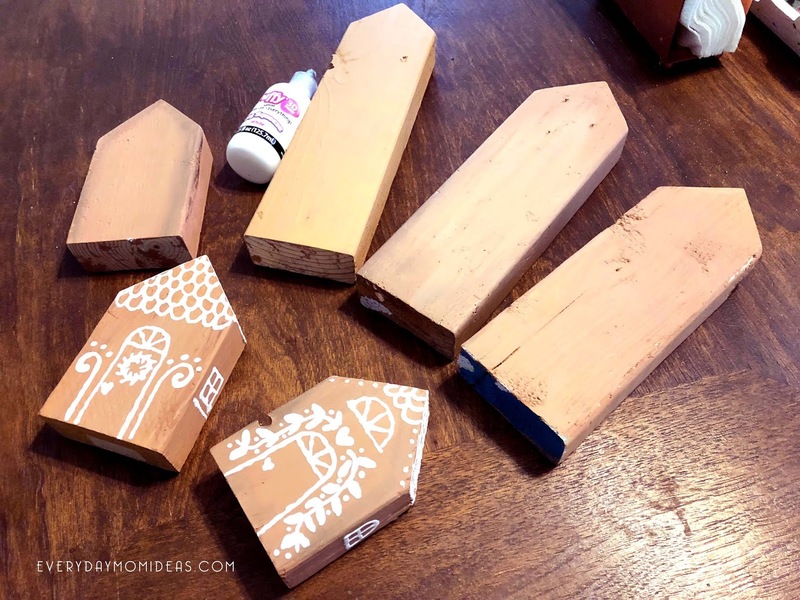 If you are making these for a kids craft I suggest you paint all the wood ahead of time and let the kiddos just paint on the white fabric paint part. There are so many fun gingerbread designs and inspirations on Pinterest. I took a bunch of different doodles and added my favorites to my houses. When using the puffy paint hold the bottle a tiny bit from the house so that you don't squish down the paint. You want the fabric paint to be a fluffy and fresh frosting. Let dry overnight. These gingerbread houses looks good anywhere they go. I have displayed my gingerbread village on my kitchen hutch. 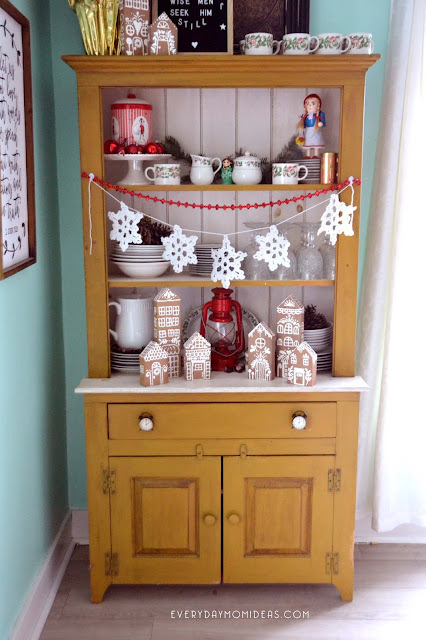 I thought it went perfectly there with all the Christmas dishes and dinning room decor. 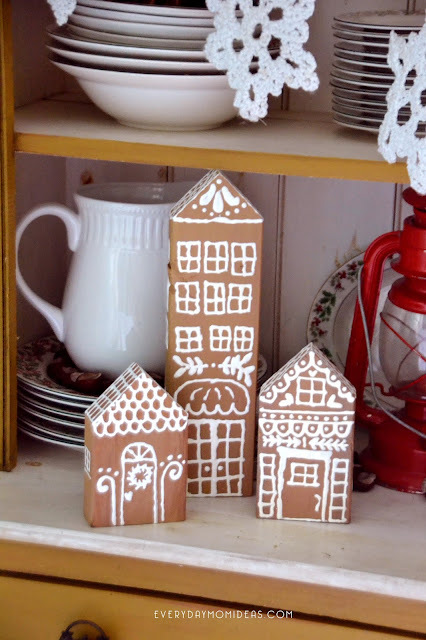 But These Gingerbread houses look good anywhere. 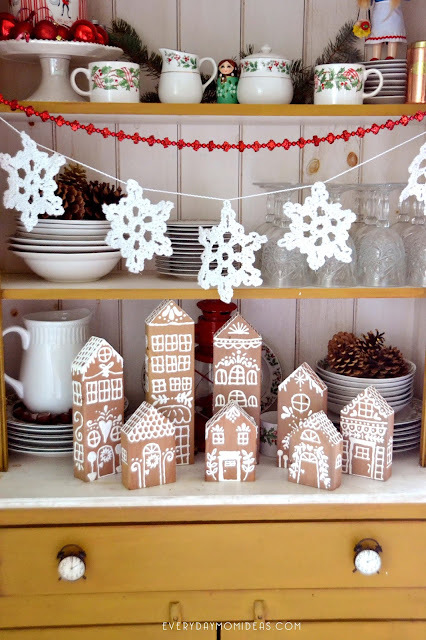 I would love to see your 2x4 gingerbread houses and share them also with my readers on my social media site. Please send me an email or tag me on my social media. 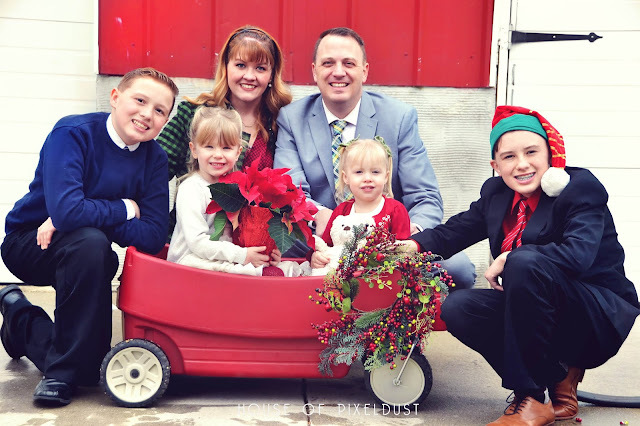 Below is a Pinterest friendly version of this post for you to share with your friends and family or save for next Christmas. 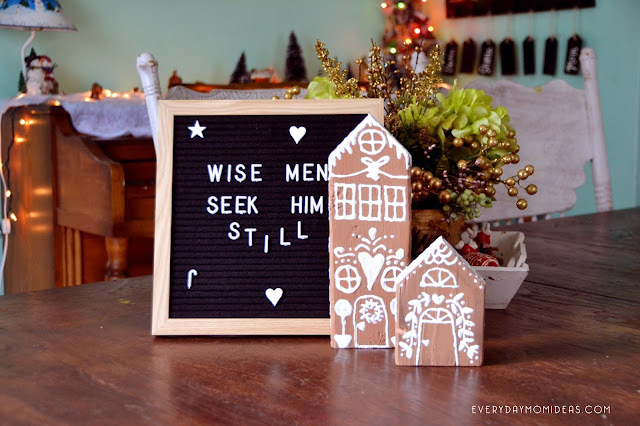 Hope you Enjoy This fun holiday craft. We all know how harsh winter can be on our skin. With howling winds, driving rain, cold air, freezing temperatures and hot, drying artificial heat. It’s no wonder our skin feels dry, flaky and tight which not only looks unsightly but feel uncomfortable. With little moisture in the air over the winter months we need to take extra good care of our skin. You might have the right foundation and the best primer for your skin type – click here to see the best primers as rated by vogue– but what else can you do to keep your skin healthy? Read on for some helpful tips and advice on how to keep your skin soft and glowing all winter long. There’s nothing more soothing than a gorgeously hot bath or shower, especially when it’s freezing cold outside. But washing your face, body and hands in hot water is actually stripping your skin of vital oils and natural moisture. So, try to wash in lukewarm water instead, you’ll really notice the difference. There are literally thousands of moisturising products available, but during the winter months you need to be careful with what you choose. Many petroleum based moisturisers will actually dry out your skin more, so it’s better to opt for a formula that is full of nourishing and hydrating properties. Go for an oil based solution too! Ingredients such as lavender, jojoba and chamomile for a natural moisture boost. Get used to wearing gloves and a nice thick scarf to protect your skinfrom the freezing temperatures and the harsh winds. So, you have the perfect excuse to go and treat yourself to a new set of gloves! If you’re going to be doing anything where your hands will get wet, then wear gloves too, that includes washing the dishes and cleaning the bathroom! And don’t forget the sunscreen. Yep! It’s true, the winter sun is just as damaging as the summer sun so make sure your makeup has an SPF Rating of 15 of higher. We’re always reaching for cool drinks in the summer, whether it’s a glass of ice water or something a little bubblier, keeping hydrated in summer is something we’re conscious of. But, when it comes to winter, we tend to opt for warm drinks such as apple cider and hot chocolate which don’t have as many hydrating capabilities. But drinking plenty of water throughout winter will not only help with brain function and keeping you awake, but it will also help your skin to stay hydrated too. Why not try a little hot water and lemon?